Co-director of the education program for aponevrotomy by needle technique for Dupuytren at the Rheumatology Unit for Hand Affections of the Lariboisière Hospital in Paris since September 2006. Animation of educational workshops on aponevrotomy by needle technique at the day of practical rheumatology at the medical Len ; the 2nd and 3rd of February 2007 with the doctor Fouad Fayad. Animation of clarification workshops on viscosupplementation of the ankle and shoulder at the congress of de French Federation of Rheumatology ; the 3rd and 4th February 2007 with doctor Serge Herman and doctor Henri Ollagnon. Presentation on viscosupplementation at the GRRIF congress in Agadir ; the 11th and 12th of March 2007. Animation of a workshop about infiltration techniques on fingers at the 18th workshops of Deauville, Procter and Gamble ; the 17th March 2007. Presentation of the aponevrotomy by needle technique at the LITAR congress in Hammamet ; the 27th, 28th and 29th of April 2007. 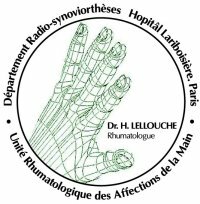 Presentation of the trapeziometacarpal osteoarthritis at the annual congress of the association of rheumatologists of the Val d’Oise ; the 25th of May. Clarification on Dupuytren’s contracture at the day of FMC of the west rheumatologists ; the 6th of June 2007. Teaching of the aponevrotomy by needle during the education days of the AFORSPE in Paris ; the 9th of June 2007. Scientific coordination and scientific advice about infiltration techniques on the Expanscience DVD : injection et puncture of the hand techniques (October 2007). Presentation of infiltration techniques on the wrist at the day of the Rheumatologic Unit of Hand affections from the Lariboisière Hospital ; the 6th of October 2007.